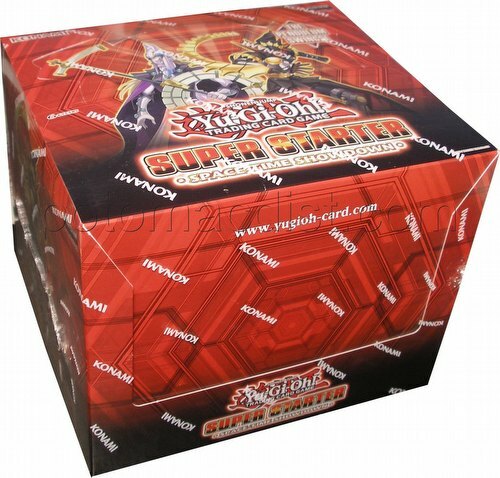 Each $82 box contains 10 decks. Each deck contains 50 cards. Designed to teach new Duelists how to Duel with friends with a 40-card pre-built deck right out of the box, Duelists can then upgrade and build their deck out further with 2 randomized Power-Up Packs containing additional cards. Super Starter: Space-Time Showdown also gives Duelists an exclusive first look at the newest game mechanic, Pendulum Monsters, an innovative new monster type that blurs the line between Monsters and Spells. Pendulum Monsters can be summoned as regular Monster cards to attack or defend, or you can activate them as Spell cards in new Pendulum Zones to activate extra special abilities and allow Duelists to Pendulum summon. In addition to 14 brand new cards in every deck, each Power-Up Pack comes with 5 cards from a 15-card set, including two guaranteed Ultra Rare cards - Dark Hole and Odd-Eyes Dragon. Each starter includes 38 commons, 2 super rares, a beginner's guide, a game mat, and 2 Power-Up Packs containing 5 cards each.